Our project consists of designing a cellular biosensor . We use as a chassis an EnvZ-E. coli strain, and construct two different devices, a sensor and an actuator, assembled using OmpR-P as a standardized mediator. The sensor device contains a receptor protein and a synthetic two-component signal transductor, both implemented as new parts in the Registry of Standarized Biological Parts . The device has been inspired on Hellinga's work , sensing TNT and other molecules by using a mutated periplasmic binding protein (PBP). Thus, our team thought in building a PBP that binds a vanillin molecule. The receptor protein has been computationally designed using a ribose binding protein as scaffold and finding the necessary mutations to change its ligand affinity towards vanillin, thus allowing the modified E. coli tasting flavors. Our computational methodology  can be used to test other molecules too. The synthetic two-component signal transductor was built by fusing the periplasmic and transmembrane parts of a Trg protein with an EnvZ kinase domain . We expect this part to be very useful for future biosensors projects. 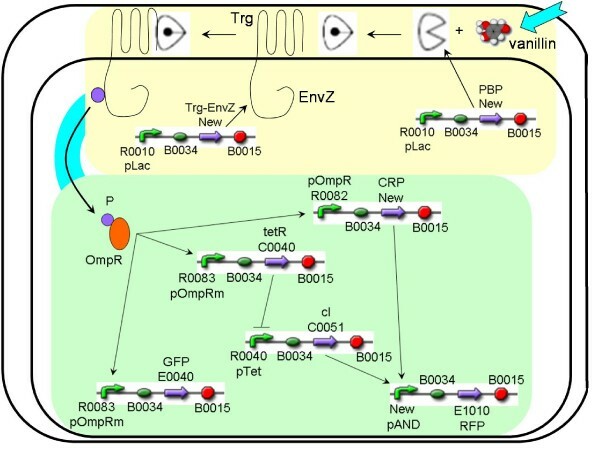 When the PBP-vanillin complex binds Trg, an allosteric motion is propagated to the cytoplasmic EnvZ kinase domain, resulting in autophosphorylation and phosphate transfer to the OmpR transcription factor (OmpR-P), which then induces transcription of the pOmpR promoter. 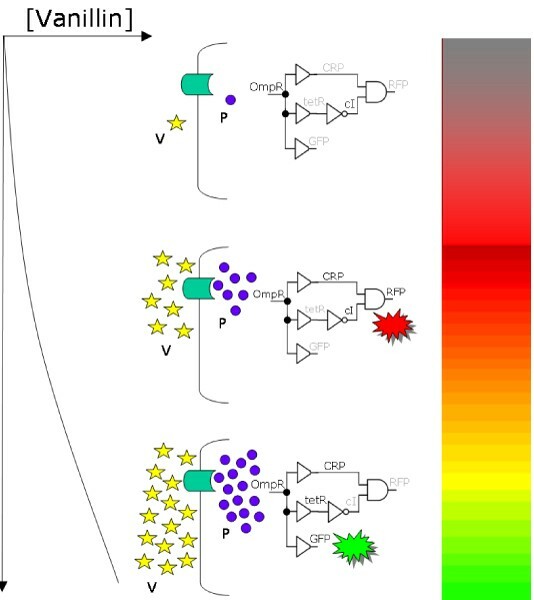 We use a synthetic genetic network as the actuator, which takes as input OmpR-P and as outputs GFP and RFP. At intermediate input levels, RFP will be expressed, whereas GFP is expressed proportionally to the input to obtain a graded response if we superpose the outputs. This later device has been inspired on Weiss' work on pattern generation , but in this case we use a new two-regulator promoter to integrate the signals. This synthetic promoter is synergistically activated by two transcription factors cI and CRP (implementing an AND logic gate) , and it will be one of the first of its kind at the Registry . We propose an extensive use of this type of promoters for future synthetic circuits, due to their small sequence size but sophisticated behavior. We have simulated our actuator device by using Matlab, and we have done a parametrical sensitivity analysis. On the other hand, we have obtained the sequence for the vanillin receptor by using a computational procedure . We have used parts from the Registry  to implement our constructions by using standard assemblies . Plasmids were derivated from pUC containing antibiotic resistances such as ampicillin or kanamycin. Furthermore, we have used DNA synthesis to obtain the CDS of the vanillin receptor. For the synthesis of the AND promoter , we have used DNA synthesis from oligos . The CDS for the CRP and Trg where obtained from genomic PCR. The growth medium was LB at 37°C with the corresponding antibiotic. The reporters fluorescence has been measured by using FACS. We show the whole system (Figure 1) and its functional mechanism (Figure 2). Nowadays, we continue working on this project. All parts are already available. Hence, tasks are concentrated in assembling them. Then, we will charaterize the biological devices. Biological scheme of the system using parts . The yellow set shows the sensor device and the green one the actuator. Mechanism of the system. Plot of the reporters according to the vanillin concentration. We thank A. Aparici, M. C. Aroca, J. Carrera, C. Edo, G. Fuertes, D. Giménez, C. Mata, J. V. Medrano, A. Montagud, C. Navarrete, E. Navarro, P. Tortosa, M. Báguena, P. Fernández-de-Córdoba, A. Ferrando, J. Salgado, and J. Urchueguía as Valencia iGEM team members. In addition, we thank E. O'Connor and A. Moya for technical equippement access. This work was supported by the EU FP6 NEST SYNBIOCOMM project, by the Universidad Politécnica de Valencia, and by the Universitat de València.